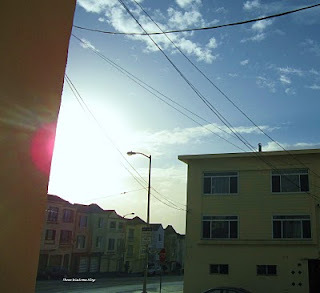 The weather has been good this week as opposed to the week long lightning and thunderstorms that plundered San Francisco last week. 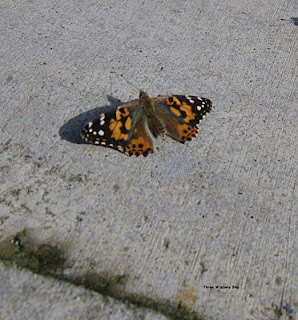 The sun was out and the temperature was in the 60's which was very suitable for our Painted Lady butterflies to be set free. 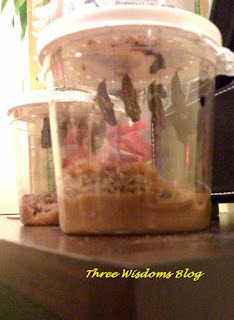 I shared the butterflies developmental stages in my "Our First Success" post so this is a follow-up of that post. My little girl misses her butterflies. She looks outside her bedroom window since release day hoping the butterflies would return. She didn't check yesterday or today so I think she gets it now that the butterflies have flown far away with their friends. It's one thing to hear a story about how someone was given a ticket for reckless driving but, it's total disbelief when you actually witness the stupidity of a rude driver getting a ticket. Case in point: Sunday afternoon at a busy street. I had just gotten inside my car after buying some pastries for my girls. My girls wanted to eat a bit first inside the car so there I was sitting and waiting for my girls to finish eating when I noticed a car on the opposite traffic lane waiting for the parking spot next to me. . 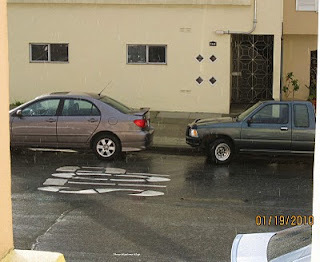 Okay, in order for this driver to take this parking space, he would have to make an illegal U-turn because it was a two-way traffic street and he was on the opposite lane. I'm looking at the guy and thinking he must be crazy. When I looked away, I saw a police officer standing right by the third parked car. Ohhh, this is not going to be good. So the parking sequence was my car, the car next to mine was pulling out, and the police officer was standing at the third car. At this point, everything happened so fast. Another car had just made a right-turn and took the parking spot. The driver on the opposite lane, who had been waiting for that spot, honked at the woman that just pulled in, rolled down his window and screamed, "I saw that spot first!" He honked again. The lady, blessed her heart because she legally have that parking spot, pulled her car out and drove way. The other driver made a U-turn and parked into the spot. What do you supposed the police officer did? I'm sure that driver was too busy concentrating on the parking spot that he failed to see the police officer standing literally right in front of him. I can only imagine the total shock when the officer knocked on his window. Of course, the guy got a big fat ticket which will cost him big $$$ in San Francisco. My two little princesses finally got their "Live Butterfly Garden" gifted to them by their uncle several weeks ago. I didn't buy it for them because I didn't think it would be 1) possible to grow butterflies, and 2) with my girls' track record on killing any living thing, I think we have sinned enough. Well, surprise..surprise ... our first ever successful "pets" that didn't die on us! 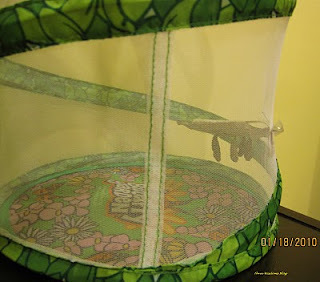 The Live Butterfly Garden kit comes with 5 larvae in a cup and a pop-up mesh basket. The bottom of the cup has nutrients for the larvae to eat which, by the way, looks like wet brown sugar. Of course, there was a lid and tiny air holes around the rim. Within a few days, there was silk around the larvae, and within a week, the larvae grew into caterpillars. A week or two later, the caterpillars crawled to the top of the cup and hung themselves upside down on a paper disk on the lid. During this stage, the caterpillars hardened and formed chrysalids. One of the five chrysalids fell to the bottom of the cup. I didn't know what to do with it because based on the instructions, you have to pull away the paper disk and pin it on to the lower inside mesh basket's wall. It was pretty hard pinning the disk to the basket's wall because I was afraid the shaking movement as I'm attaching the disk might cause the chrysalids to fall off. Well, after several attempts, I was finally able to attach the disk to each of the girl's basket. I placed the fallen chrysalid on a piece of tissue on the bottom of the basket. 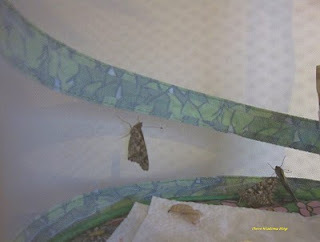 For the past couple of days, one by one, a butterfly emerged from each chrysalid. 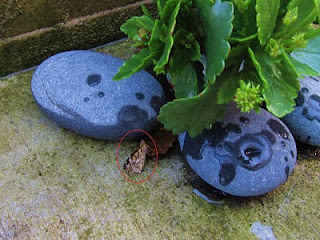 As for the one I placed on the tissue, it didn't make it. If it wasn't for my eldest daughter remembering that we have to feed the butterflies (good thing she also read the instructions pamphlet), I wouldn't have thought that you need to feed the butterflies. Turns out, butterflies feed on sugar water. We soaked a paper towel with the sugar water and placed it on the bottom of the basket. Who knew it was this simple to feed them! They also feed on orange which we also placed in the basket. At first glance, it looks like we have two different species of butterflies. 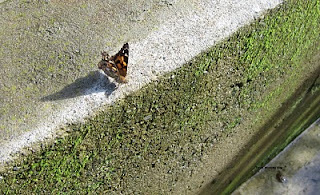 When the butterflies close their wings, their colors are gray-brownish. When the wings are spanned open, the colors are orange and black. 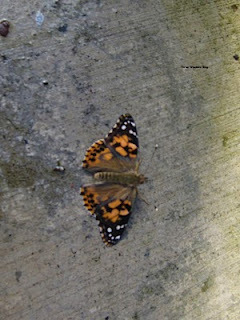 As a matter of fact, the official name is Painted Lady Butterfly. If the temperature is above 55 degrees, we can release them. I don't think we will, it's freezing cold and with our continuous thunderstorms, it's like sending them out to a suicide mission. 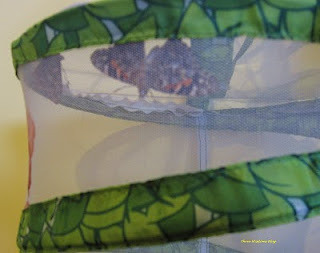 We can keep the butterflies inside the basket for their life cycle which is 2-4 weeks. My ex-coworker left a voicemail on my phone in the wee hour this morning informing me that one of other peers' husband passed away while vacationing in Las Vegas. Alas, these are the kinds of phone calls I hate to get but, it's life reality that we all have to face. What makes this news particularly more depressing is the fact that this friend of mine, Brenda, really looked forward to retirement to spend quality time with her husband, who is 20 years her senior. She had waited for the longest time to stop working and retire to enjoy life with her hubby. Brenda's husband was a retired U.S. marine. Her husband was such a romantic and loving man. He would wake up and make his wife and only daughter breakfast every single morning. He'd call during lunch time to have a brief chat with his wife every day. He planned all the family vacations. I can only imagine how much Brenda will miss this family routine. I also think about the awful truth that sometimes the one thing that you yearn for the most is given to you for only a short period of time to enjoy. I remember Brenda always talked about retirement and all these wonderful places she and her hubby were going to visit and all these things they planned to do. I was so happy for her when she was able to retire. She was just glowing and her happiness just beamed out so contagiously. You can't help but to feel happy for her. I've been thinking a lot today. We all plan for the future and we put off doing things right now thinking that we will have time and perhaps money to do what we wanted in the future. Just remember to enjoy the ride, stop and smell the roses, enjoy the beauty of life as it presents to you in the moment, and don't let your goal from point A to point B takes precedence in that you forget to enjoy living. A memorable quote I have is by Christian Furchtegott Gellert: Live as you will have wished to have lived when you are dying. By now, I guess many people have heard about the devastation in Haiti from a 7.0 earthquake. What I heard from the news last night was Haiti is a very poor country with the majority of the population living in poverty. Cell phones and cameras are not common items so therefore, images of the devastation will take a while to filter out. I checked the news today on many Internet sources and saw some of the pictures posted online. It looks like the vast majority of the country's infrastructures and buildings crumbled. We're only 13 days into the new year and we're greeted with a scary reminder of either global warming or the supposed apocalypse approaching us in 2012. We were supposed to have dinner with my parents last night. Mother said she was making her famous seafood noodle soup but at 6pm, I got a change of plan phone call from her. She didn't have time to buy fresh fish after work. Rather than whipping out a fast dinner in an hour, my family decided to eat out. 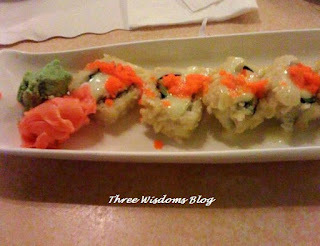 We dined at our local favorite Japanese restaurant, Noriega Teriyaki House. I'm not a big meat eater so I ordered Wonton Vegetable Noodle Soup. It's a new item on the menu. 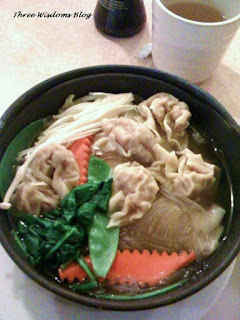 The broth was delicious, very flavorful and not bland like most other wonton noodle soup I've tried at other restaurants. Well, here's the catch about tasty broth - LOTS OF MSGs. I didn't get thirsty for the rest of the night so I know there's no or very little MSGs in the broth. 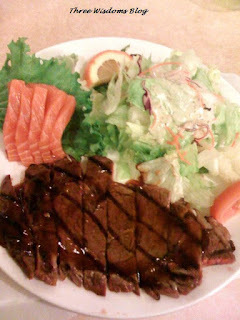 My husband ordered Beef Teriyaki with Sashimi (raw salmon). This restaurant has very tasty salad dressing that goes with their rice dishes which looks like a glob of mayonnaise in the picture. Every single person I've dined with complimented about the salad dressing. 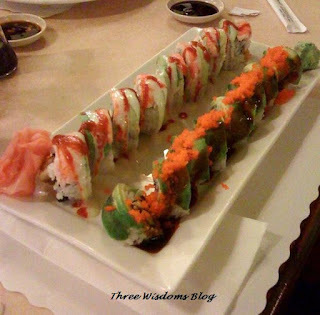 Caterpillar roll (the one with avocado topping) and Fire and Ice roll (sriracha hot chili sauce drizzled on the top). Plan A and B. Be Prepared! In light of the recent Bay Area earthquakes, my family discussed about our course of action plan should the "big one" strike. We made a list of things that we need to replenish such as can foods, bottled water, and medical emergency supplies. Power outage is a definite certainty so flashlights and candles are a must-haves. My brothers suggested MRE's - Meals Ready to Eat - packages in case we don't have water, gas and electricity. These handy meals can be eaten right out from the pouches. MRE's have an unbelievable shelf life of 5-10 years which is very long. I think dried or packaged foods have a much shorter shelf life of 2-3 years. Actually, the longer the shelf life of packaged food, the worse it is. Imagine the amount of preservatives used in keeping the food that long but that's something you don't care for when you're trying to survive. I learned that MRE's were initially developed for soldiers in battle but now they're popular items to be used in camping and as emergency food. I've never heard of MRE's up til like two days ago. 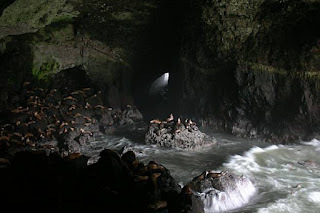 A tsunami is something that is always on my mind. I suggested having an emergency kit on the rooftop but everyone looked at me like I was crazy. When the water comes, every house will be submerged in water, wouldn't it make sense to have an emergency box ready up on the rooftop? It's not like you're going to have time to run around the house to grab this and that and then climb to the rooftop. I think my main concern is how to get to the rooftop. My house has several skylights so I'm checking to see how I can break them open. I think if the water comes quickly, it'll be pretty darn hard to climb to the rooftop. I don't know how to swim which is definitely not good. My brother suggested inflatable life vests and rafts. I jokingly said maybe I should keep a life vests on me and my kids at all time so we'll have instant access to them when the time comes. There's a great deal of planning to do but I think it's always better to have a game plan. I hope for those of you who are living in natural disaster areas to take care and try to be as prepared as possible. I remember this formula in college and it serves very well in my philosphy in life: PREPARATION + LUCK = SUCCESS. I don't know what's happening but we have had 3 consecutive days of earthquakes in Northern California. On Thursday, I felt my house rattled when a 4.1 magnitude earthquake hit. 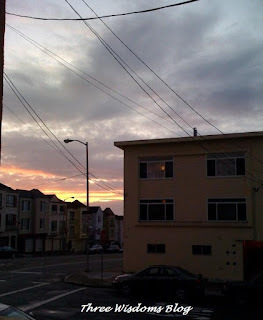 On Friday, a 3.8 earthquake struck but this time around, I didn't feel it. Today, a 6.5 earthquake struck but luckily it was off the coast, in the Pacific Ocean. Even though today's earthquake epic center was in the ocean, it was powerful enough to cause water, gas and sewer leaks, power outages, and broken shop windows. ***There is a small chance — 5 to 10 percent — of another magnitude-6.5 temblor or larger hitting the area over the next week, but the odds dramatically decrease as time passes. ***There's also a 78 percent chance of a strong and potentially damaging aftershock magnitude-5 or larger over the same period. The earthquake probabilities are based on statistical observations of past earthquakes in California and are not predictions. 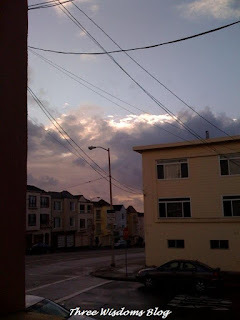 When we bought our house in 2005, we asked our insurance agent about earthquake and flood insurance. 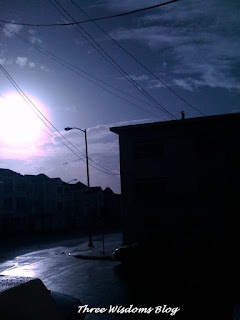 Who knew that there's no flood insurance for San Francisco residents because we don't have floods in our city. Well that's ridiculous. What about tsunamis? We'd be out of luck should we ever get hit by a tsunami. So now, we're all just praying and hoping for safety because it's not a matter of will a big earthquake come because it's 100% sure it will but a matter of when. 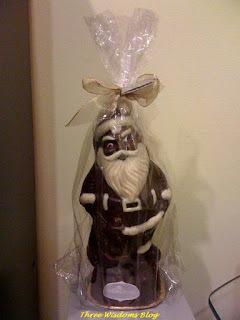 A family friend gave this chocolate Santa to my 4-year-old daughter for Christmas. It is heavy! Solid chocolate not one of those hollow ones. My little belle has been staring at her gift every single day, just standing in front of it and staring at it and then she'd go about doing her own things. When she first saw it, she asked, "How come his face looks that way?" followed by "he looks mean". Here's a closer look of Santa's facial expression. What do you think? Last night, my daughter looked at her gift and asked if she can eat it. Well actually, she's been asking since after Christmas. 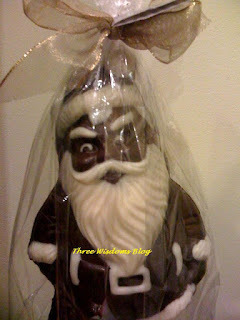 Her chocolate Santa is standing on a TV speaker. It's about a foot or taller. I looked at it and thought geez, now how do you eat it? It's rock solid and heavy. Take something hard and just smash it into smaller pieces? 2010! 2009 was such a turbulent year for so many people including myself. Corporate layoffs, I was part of that. Bad investments? Got burned there too. Lawsuits? Got pulled into a messy frivolous lawsuit and won. Having gone through these bad experiences, I must admit, I feel lucky that I didn't have it as bad as most folks so I'm thankful and feeling very blessed. When I found out that my department was going to close in March, I embraced the news. My workplace was horribly polluted with low morale, gossips, negative employees, and bad management. It was a really unhealthy work environment. Lets see, we had someone pouring hot chili sauce over another worker's keyboard out of spite; someone smeared vinegar all over another worker's desk, which got her really sick because she has severe asthma; and yes, breakdowns and tantrums by grown adults. I mean, shouting matches with things slammed. Last but the least, the vice president came to work 3 out of 5 days and oh, the 3 days that he was in, he only worked half day. 99% of the time that I went to his office, he was either on Yahoo or some other websites. Needless to say, there was absolutely no respect whatsoever for this guy. I was soooo glad the department closed. The only thing that kept me going was I loved what my job entailed: coaching and training people. 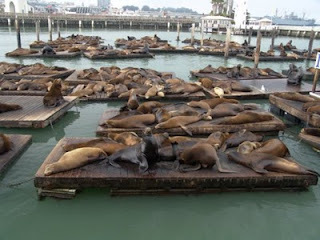 I also had good working rapport with some of my peers but the place was just too much. 60's going back to work because they lost all of their retirement money. So again, I'm feeling very fortunate that I didn't have to endure this kind of hardship with the lost of my bad investments. I was one of the defendants in a frivolous lawsuit filed by a family friend. Having gone through this lawsuit taught me a valuable lesson: always, always write in the memo field of your check the purpose the check was either written out or deposited. In a nutshell, 5 years ago, a close friend of my parents asked me to get him new cash for Chinese New Year because I worked for a bank. The friend gave me a cashier's check for $5,000. I deposited the check into my account and when the check posted with no problem, I got new cash for the friend. The friend sued me and some other people that he had loaned us money and was never repaid. Luckily because I know the rules and procedures of banks, I was able to obtain copies of transactions to get the most valuable information stamped on the bank records which were the time and date of the transaction. With that information, we were able to subpoenaed the surveillance videotape and showed in court that the plaintiff was with me at the bank. The judge, thank goodness, ruled that the case was indeed frivolous, awarded me with court and legal fees. You know the saying: Experience is not what happens to you. It is what you do with what happens to you. I've learned so much from last year's bad experiences. I've grown wiser and more careful with my money. I wish you all a healthy and fulfilled 2010. Cheers!